The electrode surface can be modified through physiorption of lipid-like molecules, such as octadecanol. This adsorbed layer can change its orientation or organization on the surface in response to changes in the electrode potential. At negative potentials, this layer can be forced off the electrode surface and exist as aggregates near the electrode surface. 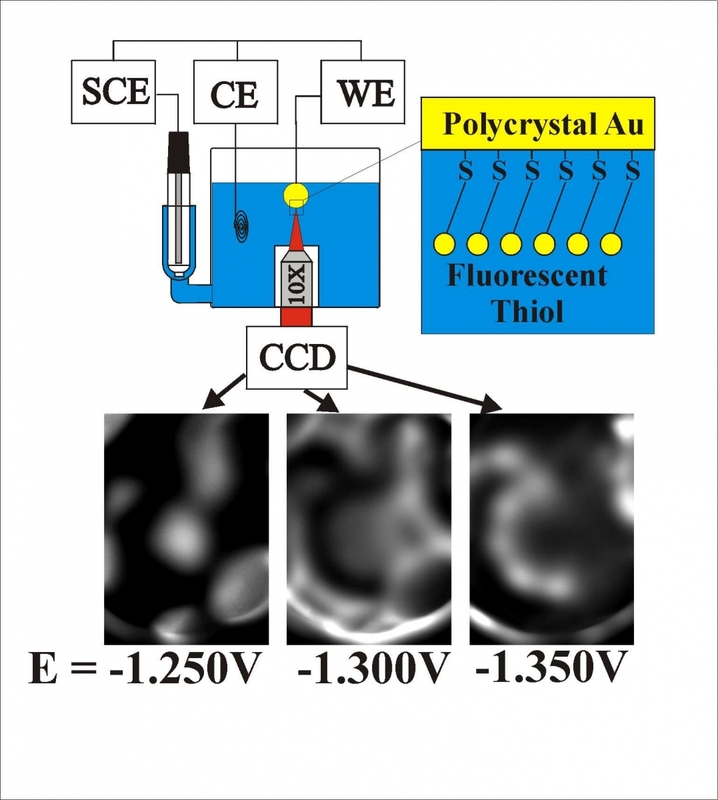 We study these potential induced changes using fluorescent tagged octadecanol - like molecules, measuring fluorescence as a function of electrode potential. The fluorescence we measure is very dependent on the distance the fluorphore is from the electrode surface, and therefore we only see the desorbed molecules, since the adsorbed molecules are not strongly fluorescent. The image below shows the fluorescence images and schematic representation of the desorption (negative potential) and readsorption (positive potentials) processes. The structures observed are around 10 um in size (limited by our optical resolution) but could be clusters of smaller clusters. 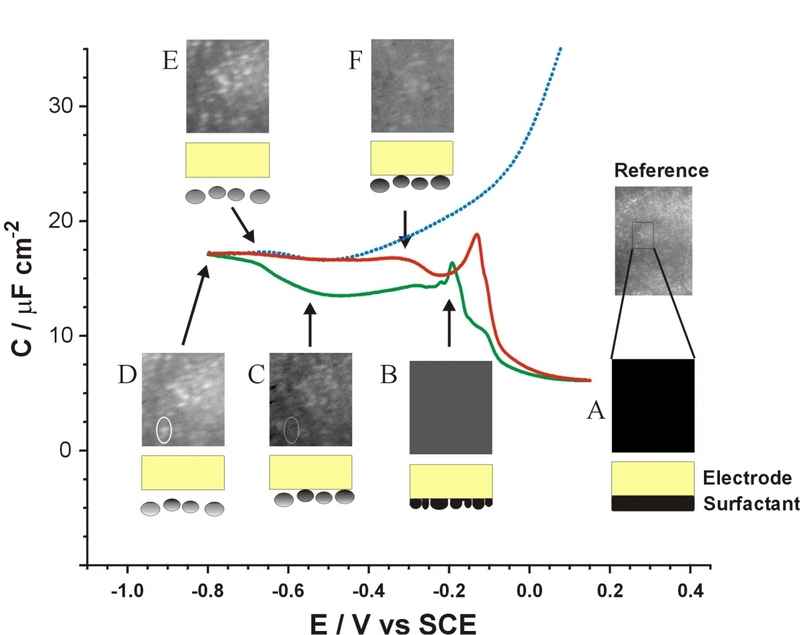 The same type of process as described above was observed for electrode surfaces that are modifed using alkyl-thiols, so-called SAMs (self-assembled monolayer). We have shown that removal of the fluorescent labeled SAMs results in similar changes in fluorescence. Desorption of these molecules results in removal of the SAM from particular regions of the electrode surface depending on the potential used. Interestingly, these molecules do not seem to re-adsorb to a significant extent. We are exploring the surface characteristics of SAMs created for DNA biosensors in collaboration with Hogan Yu at SFU. The DNA is modified by a thiol and allowed to assemble onto a gold surface. The non-specically adsorbed DNA is then displaced through further exposure to another thiol(MCH). Typically the DNA we use contains a fluorescent group at the end furthest from the gold surface. The resulting mixed layer is then used to sense for complimentary strands in solutions etc. We use our techniques to look carefully at these surfaces and try to explain the electrochemical/spectroscopic responses observed. We have recently published these findings.